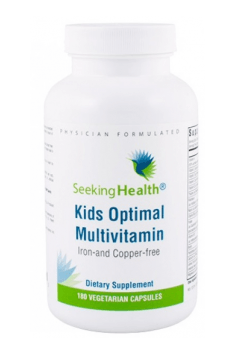 Seeking Health, Kids Optimal Multivitamin is an advanced dietary supplement for children and adolescents, containing optimal doses of as many as 28 components in easily assimilable forms. The preparation helps to supplement the diet in minerals and vitamins essential for the normal development and efficient functioning of the nervous system. The right supply of vitamins and minerals is essential for the normal development of children and adolescents. All dietary deficiencies occurring in the stage of fast development can have a negative effect on the health and functioning of the organism, not only in that period, but they can also contribute to an increased risk of non-communicable diseases later in life. A consequence of maintaining deficiencies can be such symptoms as: weakness, problems with concentration and new information assimilation, as well as disorders in the functioning of the immune, circulatory, or skeletal systems. As adolescence is a period of dynamic growth and development of the organism, the demand for energy, minerals and vitamins is increased. The vitamin complex is a full range of vitamins necessary for the normal functioning of the organism of a child. Vitamins are a complex group of organic compounds essential for maintaining good health and proper metabolic processes. The preparation contains the vitamins of the B complex, which are responsible for the normal functioning of the nervous and immune systems: riboflavin, niacin, pyridoxine), biotin, pantothenic acid, cobalamin (as methylcobalamin and adenosylcobalamin), and folate (as 5-methyltetrahydrofolate – 5-MTHF, and calcium folinate). In the case of the last two vitamins, their methylated forms are used, as they support methylation processes and prevent disorders connected with them (for example, hyperhomocysteinaemia, which increases the risk of cardiovascular system diseases, as well as disorders in neurotransmitter synthesis, or improper detoxification and inflammation). Vitamin A is a powerful antioxidant. It supports the eyes and helps to maintain normal skin function. Along with vitamin E, it constitutes one of the elements of the organism’s first line of defence against the harmful activity of free radicals. Vitamin C participates in the normal production of collagen and is responsible for the right condition of the skin and mucous membranes. Apart from that, it supports the immune system and helps to fight infections. Vitamin D is essential for the normal development of the skeletal system and prevents rickets in children. Vitamin K plays an important role in homeostatic processes. Its deficiency in the organism can lead to deficiencies of coagulation factors, which can result in bleedings in new-born babies and toddlers. The complex of minerals is a source of elements in highly bioavailable forms, which makes them much easier for the organism to absorb. Minerals are crucial for maintaining a good mood and health. Magnesium and calcium are structural elements in teeth, bones, hair and the skin. Improper levels of those elements in the organism can be a reason of low mineral density and can increase the risk of rickets. Moreover, magnesium participates in energy metabolism, eliminates stress, and determines the right functioning of the nervous system. Zinc participates in various processes responsible for maintaining pregnancy and the right development of the foetus. Zinc deficiency during pregnancy can cause premature birth, low birthweight, or delayed growth and mental development. Iodine participates in the synthesis of thyroid hormones and, therefore, it is responsible for the normal development of the nervous system and supports brain function. Too low iodine supply can lead to low energy levels, increased susceptibility to infections, and distorted psychosomatic development of a child (e.g. ADHD). Potassium is essential for maintaining the right water-electrolyte balance. It helps to maintain acid-base balance and contributes to normal nerve-muscle excitability. Manganese participates in the formation of nucleic acids and proteins. Molybdenum supports the immune system. Chromium supports carbohydrate metabolism and improves insulin sensitivity. Boron plays an important role in mineral, lipid and hormone management in the organism, it supports memory and concentration. Vanadium found in compounds exhibits antidiabetic and anticancer properties. Betaine anhydrous supports methylation processes and helps to reduce excess homocysteine, thanks to which it enhances the functioning of the circulatory system. Extracts of shilajit (Mumio) and milk thistle enhance the functioning of the liver and support detoxification processes in the organism. Lutein has antioxidant and photoprotective effects. It increases the protection of the eye against dangerous UV radiation. To sum up, Seeking Health, Kids Optimal Multivitamin is a fantastic supplement for the everyday diet of children and adolescents. The consumption of vitamins and minerals by children and adolescents is often insufficient when compared to the intake recommended for those age groups. Thanks to the optimal content of minerals and vitamins, the preparation constitutes infallible support for the organism in the special period. Kids Optimal Multivitamin 180 caps. Take 6 capsules daily with food or as directed by your healthcare professional. Do not take within 5 hours of bedtime as it may interfere with sleep. During the period of childhood, all the systems and various defence mechanisms in the organism develop intensively. Despite what people might think, not only adults have to deal with stress in everyday life – children and youngsters also experience stressful situations (like the first day in a new school or kindergarten, making new friends, tests, homework). Stress can cause many changes in the organism, like lack of appetite, increased susceptibility to infections, low energy levels, worse memory and concentration, and, in consequence, an insufficient supply of nutrients. Therefore, it is a great idea to have an advanced preparation that will not only support the normal development of a young organism, but also strengthen the organism’s defence mechanisms and supplement nutrient deficiencies. HPMC (capsule), ascorbyl palmitate, medium-chain triglycerides oil and silica.